Horses give mobility, not shock value in combat. Dragoons do not charge home, but ride to critical spots on a battlefield where infantry firepower is needed. 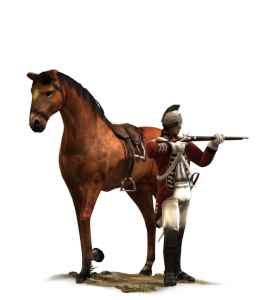 They carry smoothbore, muzzle-loading muskets with shortened barrels (to make reloading easier) originally called “dragons” or dragoons; over time, this name transferred to the men.